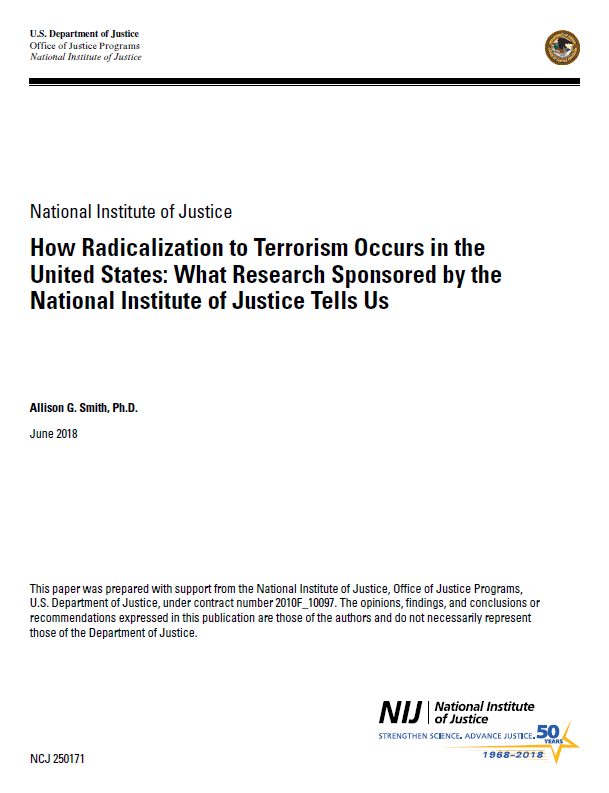 Since its founding in 2012, the National Institute of Justice’s Domestic Radicalization to Terrorism program has sponsored research on how radicalization to terrorism occurs in the United States in order to support prevention and intervention efforts. These projects have taken a variety of approaches to examining the process of radicalization to terrorism, but in spite of this there is substantial overlap in their findings, which collectively provide evidence of the importance of several facilitators of radicalization and the need to take into account how this process unfolds within individuals over time. At the individual level, the radicalization process often involves embracing a terrorist belief system or narrative that identifies particular others or groups as “enemies” and justifies engaging in violence against them. Individuals may also begin to identify themselves as terrorists, as well as to engage in activities that highlight their commitments to their new beliefs, identities, and/or others who hold them. It is, however, important to note that while these beliefs and behaviors may facilitate the movement to terrorism, this outcome is not inevitable. Those close to these individuals may become aware of the changes that their friends and family members are undergoing and attempt to address them or seek help from others who can. An important implication of this is that trusted information and resources need to be available to assist in this effort. Another is that prevention and intervention efforts may benefit from addressing beliefs that justify violence and helping individuals to develop identities in which these beliefs are not central. In their completed NIJ-sponsored research, a team led by the University of Arkansas tested whether role identity theory and framing theory help to explain how individuals and groups radicalize to terrorism (Smith et al., 2016). In doing so, the researchers built on previous research conducted using the American Terrorism Study (ATS) database (e.g., Smith & Damphousse, 2009; Smith, Damphousse, & Roberts, 2006; Smith, Roberts, & Damphousse, 2013) and focused not on testing a complete model of the radicalization process but rather on testing what they viewed to be a crucial component of it: the construction of a terrorist identity. This process is outlined in Figure 2 on page 11. Several concepts displayed in the figure are central to understanding the analyses the team conducted. The first two are identity salience and identity pervasiveness — both of which are based on the premise that everyone has multiple identities (e.g., as a parent, teacher, musician). If an identity is salient, it is more likely to be brought to bear in a particular situation. If an identity is pervasive, it is more likely to be brought to bear in numerous situations. The researchers hypothesized that individuals with more salient and pervasive terrorist identities would be more likely to engage in terrorism.